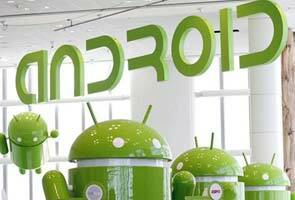 Smartphones running Google's Android operating system outsell iPhones more than two to one. And yet, even as Google's system has gobbled up market share, Apple has held onto one critical advantage - the loyalty of mobile app developers. Many developers have continued to make applications first, and sometimes only, for iPhones. They find it easier to create software for Apple devices than for ones running Android, or it may be more lucrative. Their allegiance to Apple has helped make its devices the powerhouses they are for the company. "Android may have a lead in how many handsets it ships, but it doesn't have a lead in how much money app developers are making from it," said Hadi Partovi, an investor in technology start-ups like Dropbox and a former manager at Microsoft. On Monday, Apple will seek to strengthen its ties to mobile developers with a series of product announcements on the opening day of its developer conference in San Francisco, an annual ritual where the company tries to stimulate the creative juices of this important constituency. The company is expected to introduce a new version of the iOS operating system that powers iPhones and iPads, according to people familiar with Apple's plans who were not authorized to speak about them publicly. One feature of that software is expected to be an eye-catching new 3-D map service operated by Apple that will pose a challenge to a Google map service used within many iPhone applications, these people said. "It's a lot more beautiful," said one of these people, who has seen a demonstration of Apple's maps service. At the same time, Apple is expected to update its Mac family of computers with new hardware, these people said. The conference is "the most important event of the year," said John Casasanta, owner of Tap Tap Tap, the software studio that makes the popular Camera app, available only on the iPhone. "I'm having trouble thinking of any conference that comes anywhere near as relevant." Apps are among the strongest weapons Apple and Google have for marketing their mobile technologies to consumers. The bounty of software available for Android and iOS, as varied as racing games and apps for managing recordings on cable boxes, is a chief reason the mobile phone market has settled into a two-horse race. Rival technologies plagued by a scarcity of apps, including Research in Motion's BlackBerry and Microsoft's Windows Phone, are finding it difficult to persuade developers to invest in them. Apple's continued influence among mobile app developers flies in the face of predictions that the company would steadily lose clout as Android phones flooded the market, presenting developers with a much bigger target audience. And it could help Apple avoid the fate the Macintosh experienced in the 1990s when competing with PCs running Microsoft's Windows operating system. Although many considered the Mac to be superior, Microsoft outsold Apple's computers in part by distributing its product broadly on hardware made by many companies, which helped Windows to snowball. Software developers flocked to the larger Windows PC market, which in turn attracted more customers, which attracted still more software developers to Windows. For the better part of two decades, Microsoft held the allegiance of software developers, relegating the Mac to the periphery of the computer business. In the mobile market, there is no doubt Apple's share has been overshadowed by Google, which makes Android freely available to any hardware maker that wants to build a phone with it. Although the first Android handsets did not appear until about a year after the iPhone was released, widespread support from handset manufacturers, especially Samsung, and wireless carriers helped propel Android to 59 percent of the smartphone market during the first quarter, compared with 23 percent for the iPhone, according to estimates from IDC, a research firm. There have been predictions that the huge volume of Android smartphones being sold would persuade developers to abandon or at least weaken their iPhone efforts by, for example, developing apps first for phones running Android. In December, Eric Schmidt, the executive chairman of Google, said that six months from then, mobile developers would begin favoring Android app projects over iPhone apps. "Because ultimately applications vendors are driven by volume and the volume is favored by the open approach Google is taking," Mr. Schmidt told an audience at a technology conference in Paris. That six-month mark passed last week. In the interim, the companies behind some well-known iOS apps like Instagram have made Android versions of their software. But as the technology writer and investor M.G. Siegler wrote in a column on TechCrunch last week, Mr. Schmidt's prediction that developers would begin making Android apps first did not come to pass, at least not the most prominent developers. "You failed hard in this prediction," Mr. Siegler wrote, addressing Mr. Schmidt. Christopher Katsaros, a spokesman for Google, declined to comment for this article. Developers say it is easier, and therefore less costly, to develop apps for the iPhone than for Android phones, in part because there are far more models of Android phones in use, with different screen sizes, processors and other technologies. The variations in hardware and software are not insurmountable obstacles, developers say, but performing the testing to ensure that apps run properly on most Android phones adds time and cost. "Writing apps consistently across all of them is really hard," said Nat Brown, an independent iOS developer in Seattle who has created a line of children's apps for the iPhone. Mr. Brown also said he periodically considered writing Android apps, but had decided against it in part because iPhone users have demonstrated a higher willingness than Android users to pay for apps. Flurry, a mobile analytics firm, published a report last week that estimated that for every $1 a developer brought in for an application on iOS, he could expect to take in about 24 cents on Android. "Apple is almost the default first platform you develop for and then you develop for Android," said Rob Cihra, an analyst at Evercore Partners. Furthermore, Apple has been far more effective in getting iPhone users to update their phones with the latest version of iOS than Google and its partners have with Android. This makes it easier for iPhone developers to write their apps because there is less variation in the underlying software on the devices. One other advantage Apple has among developers is the iPad, which has so far maintained its dominance in the tablet category, despite challenges by an assortment of Android tablets. Because the iPhone and iPad use iOS, it is relatively easy for developers to adapt their software to run on Apple's tablet, significantly expanding the audience of potential customers beyond the iPhone. It is difficult to say whether Apple's position with developers will remain strong if Android continues to gobble market share. But various surveys have tried to gauge which smartphones developers plan to write apps for in the near future, and the iPhone often scores very high. Still, Google is closing the gap between the sheer number of apps for Android, which stands at about 500,000. Earlier this year, Apple said there were 600,000 apps in its App Store. One occasional source of discontent among Apple's developers is the greater control that the company exerts over its App Store, for which it takes a more hands-on approach to approving software for distribution than Google does. Paul Kafasis, the chief executive of Rogue Amoeba Software in Boston, has had a couple of run-ins with Apple over iPhone apps that Apple initially rejected for different reasons. Most recently, Apple objected to a function in an iOS app, Airfoil Speakers Touch, that allowed users to listen to music streamed from a song library on iTunes and other Apple devices. Mr. Kafasis modified the function in the app, which Apple then allowed to be sold. While he chafes at the gatekeeper function Apple performs, he said he had no plans to develop products for Android.